Meninas Da Lua (Moon Girls) specialise in the traditional African-infused rhythms from North-East Brazil including the Coco, Ijexa, Maracatu, Samba De Roda, Afoxe Traditional Afro-Brazilian Orixa dances. They play mostly traditional songs and improvised singing traditions accompanied by the powerful voice of Priscilla Rios. Guest musicians play Berimbao, Viola Caipira,and Flute. Meninas Da Lua’s vibrant, high-spirited percussion, traditional Orixás dances, feminine vocals and the powerful, deep voice of Priscilla Rios pay homage to the power of the Orixás and their deep roots in the Afro-Brazilian culture of North-East Brazil. Dance Coco! Is cool and joyful. Born on the beaches in Northern Brazil, it’s a stomping/percussive social dance. Ciranda circle dancing is from Pernambuco state and mostly danced on street corners, beaches and bars. 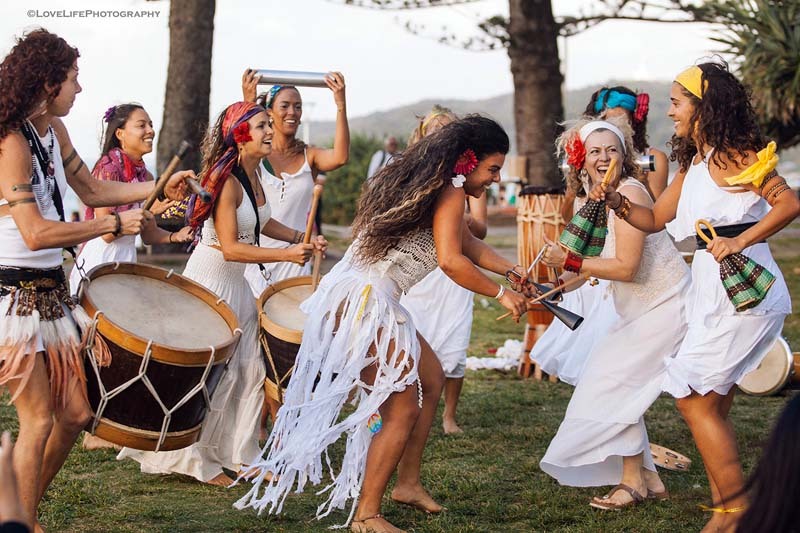 Samba de Roda is a traditional Afro-Brazilian fun dance from Bahia, performed originally after a Candomblé ceremony. The Ijexa is essentially a rhythm that is played for the Orixás, Afro Brazilian deities. These dances were brought to Brazil by African slaves.